Wholesale cannabis prices in recreational markets across the United States have fallen precipitously compared to last year, while prices in major medical markets are proving more resilient. 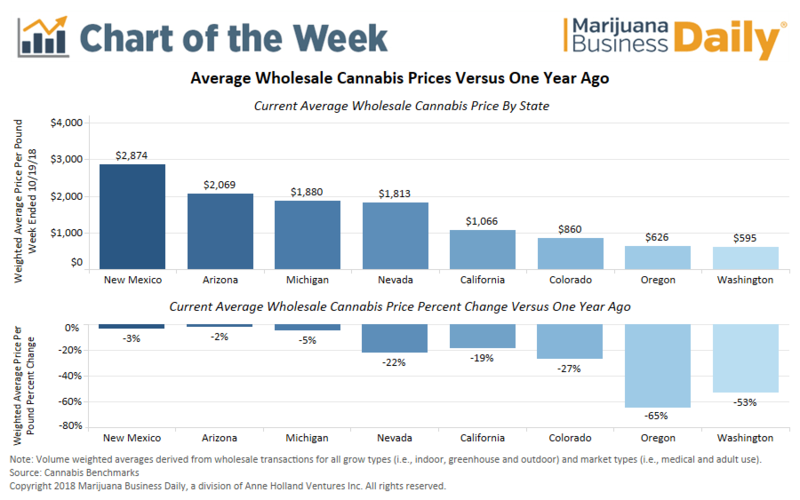 According to figures provided by Cannabis Benchmarks, a Connecticut-based provider of wholesale marijuana pricing data, wholesale cannabis prices in Oregon and Washington state are down more than 50% relative to the same week in October 2017, with double-digit declines also observed in California, Colorado and Nevada. Wholesale prices in Arizona, Michigan and New Mexico, however, remain nearly unchanged from a year ago. In Oregon, outdoor-grown cannabis prices hit an all-time low, and indoor and greenhouse producers reportedly are selling product for a loss amid intense market saturation in the state – suggesting that wholesale marijuana prices may be approaching their lower limit. Growing conditions in Washington state were excellent this year, bringing a bountiful harvest into an already oversupplied market and pushing wholesale prices down even further. This week, outdoor-grown cannabis hit a historic low in the state while prices for flower grown in greenhouses were the lowest ever recorded in any market. Despite record demand in Colorado for adult-use cannabis – cumulative sales through August 2018 were up 12% compared to 2017 – wholesale marijuana prices continued to decline. Oversupply is still a problem for cultivators in the state, and if not for mandatory pesticide testing implemented in August, it’s likely prices would have slid even more. Harvest conditions were good this year in California, bringing abundant supply to a market that’s severely constrained by the number of retail stores open throughout the state. The Golden State’s new supply chain is still developing, meaning the major fall harvest that typically hits the market around October – and pushes wholesale prices to annual lows – may not hit until November or December. In Nevada, where the market had been on the upswing, wholesale prices appear to be tapering off as cultivators catch up to what was an unexpectedly strong start to rec sales in the state. Patient counts in Arizona and New Mexico have continued to rise, though license caps in both states mean no additional businesses can enter the market. That’s insulated these states from the kind of oversaturation that plagues most recreational markets. Michigan – the second-largest largest medical market behind California – is transitioning into a fully licensed and regulated MMJ industry after existing for years under a patchwork of local regulations. After Oct. 31, all MMJ businesses in Michigan must have a permanent license. It’s likely that less than half the state’s dispensaries currently operating with temporary authorizations will gain a permanent license by the end of October, which could have a major impact on demand for wholesale cannabis coming from licensed cultivators.